In 2009, Pedro and Norma González were considering several ideas in order to add supplemental income to their household. Norma had, as a young woman, spent much time with her grandmother learning how to bake and cook. Pedro had a mind for business and they decided to join the venture in the opening of Sucrée, a cake shop providing a wide variety of cakes, desserts and pastries. Originally located at 624 W. Pecan Blvd. 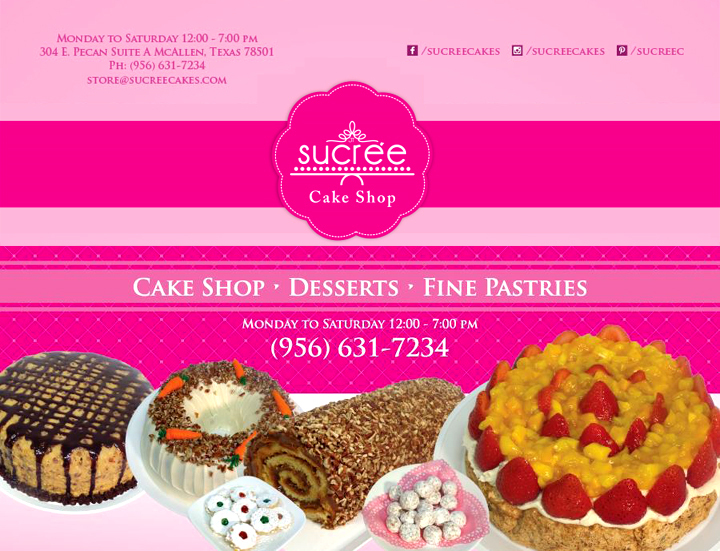 in McAllen, Sucrée can now be found at 304 E. Pecan Blvd. Suite A, just west of the main post office. When you come to Sucrée you will discover that the love for baking is evident when you first bite into one of those flavorful creations. Only the highest quality and freshest ingredients are used and they are always baked from recipe. You won't find the same texture and flavor at another bakery or cake shop. Sucrée's menu includes Mexican recipes, as well as American recipes and French recipes. Customers return time after time because they know that they will always find consitent quality in all of Sucrée's items. Whether you are craving their signature "sucrée" or you want a special occasion cake or one of their many cookies, cheesecakes and desserts, you will be glad that you chose Sucrée. If you are planning for a Special Occasion Cake, such as birthday or anniversary, be sure to call at least one week ahead to place your order. Your cake will be custom designed just the way you want it and baked fresh, ready when you need it.